This computer illustration depicts the density of space junk around Earth in low-Earth orbit. A prototype "space fence" designed to track Earth's burgeoning orbital debris population passed a key test recently, locking onto objects in a demonstration run. 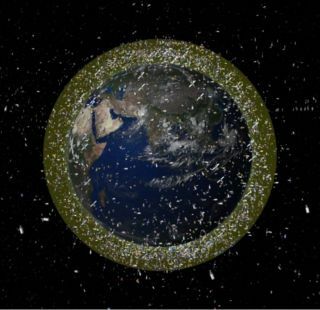 The radar system, which is being developed by aerospace firm Lockheed Martin for the United States Air Force, has successfully detected orbiting space junk, company officials announced March 8. The Air Force also approved Lockheed's preliminary design for the system on Feb. 29, they added. The Air Force is looking to replace the aging Air Force Space Surveillance System (AFSSS), which it has used since 1961 to track satellites and pieces of space junk — called "resident space objects" in industry jargon. Lockheed is developing its Space Fence under an 18-month, $107 million contract awarded last year. The company hopes to win another Air Force contract to actually build its system; the Air Force plans to award that production contract later this year. Space junk — stuff like old rocket bodies, defunct satellites and the pieces spawned when these objects collide — is a growing problem in Earth orbit. NASA estimates that our planet's debris cloud contains about 22,000 pieces as large as a softball and 500,000 bigger than a marble. The number of pieces at least 1 millimeter wide likely runs into the hundreds of millions. All of this fast-moving junk poses a threat to the 1,000 or so operational satellites currently zipping around our planet, as well as the International Space Station and other crew-carrying craft. Many researchers think the amount of space junk around our planet has reached a critical threshold. There's now so much of the stuff that collisions will generate a continual, ever-escalating cascade, causing the debris cloud to keep growing even if humanity launched no new spacecraft. One such collision occurred in 2009, when the Iridium 33 communications satellite slammed into a defunct Russian satellite. The cosmic smashup spawned more than 2,000 new large debris fragments, and many more too small to be tracked and catalogued. Lockheed's Space Fence is designed to help deal with this problem. The system, which will ultimately consist of S-band, ground-based radars at two or three different different geographic sites, will detect, track and catalog more than 200,000 orbiting objects, company officials have said. The first Space Fence site could be up and running by 2017.